Eric Hayes, the main character in Bystander, plays guitar. He’s also missing an absent father, who occasionally sends CDs in the mail. Here’s a brief excerpt from Chapter 4, the first time that subplot is explored. To set up the scene: Eric’s father calls the family at their new home, five hundred miles away. The conversation does not go well; 13-year-old Eric is uncommunicative. The phone call ends. Click, and he was gone, again. Call over. Eric looked at the phone in his hand, shot daggers at his mom, snapped it shut. He went into the kitchen, looked for something to eat. A bowl of Rice Krispies, some pretzels, anything. It had rained and some worms crawled from their holes out onto the brick patio. Eric grabbed a stick and idly poked at one, turning it over. That’s how he felt, he decided. Just like that worm. Pushed around, prodded by a stick. After a while he’d crawl back into his hole. And then, in a few days, off to school. A new hole with red bricks and homework. It would be a fresh start. A new beginning. Isn’t that what his mom said? New and improved. Guaranteed or your money back. I hit on that particular song, “Communication Breakdown,” for maybe too obvious of reasons. 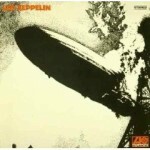 But ignoring the song’s title for a minute, it’s on the first Led Zeppelin LP. I remember listening to that album as a young kid, staring at that cover — which depicted, I later learned, the 1937 burning of the Hindenburg airship. This was probably around 1971 or so, when as the youngest of seven I reveled in my siblings’ record collections. It wasn’t classic rock back then; it was brand spanking new. Though I’m not a musician, my character, Eric, played guitar — so I knew he’d hear it differently than I did. Eric would understand the notes, what Jimmy Page was doing. I figured I’d have to look up the tabs, maybe describe it through Eric’s ears, the way a musician might hear it. That’s when I learned that part about the open E string. Then those three fat chords: D-A-D. Perfect, right? It could have been G-F-G, or whatever, and that’s what I would have typed. I’m glad it worked out way better. A happy accident. Note: If you want to rock, stick around for the solo, at 0:49. Can’t wait for my Gavin, age 10, to learn how to play this all the way through, and believe me, it’s gonna happen. The kid’s got talent. Great stuff! I chuckled at that scene in Bystander because my next book has a scene where a kid is learning how to play “Whole Lotta Love” on guitar. Great minds think alike… and/or are stuck in the 70s. I myself never did figure out “Over the Hills and Far Away.” What a bit of guitar magic that one is. Hey JP, These “writing process” posts are really wonderful. And congrats on the Booklist review. Straightforward and true.